The infamous body snatchers William Burke and William Hare are at large. The local prostitutes dull their fear with cheap whisky. The graveyard owls are hooting. Business is good. When accidental tourists the Doctor and Evelyn Smythe stumble upon one of Britain’s most lurid, illuminating chapters in history, a simple case of interest in the work of dedicated man of science Doctor Robert Knox, quickly turns sour. Just what is that time bending Scots mist? Whatever it is may put the very fabric of the universe under threat. Colin Baker is the Doctor in Medicinal Purpopes. There’s no doubt that the Sixth Doctor’s reputation has been rehabilitated by Big Finish. The trials and tribulations of Colin Baker’s time on television are well documented. For many years, he has been considered the “worst” Doctor, with bad fashion sense, sub-par companions, and only one story, possibly two, that could be considered a solid tale. Baker was the only actor to be fired from the role of the Doctor, and it was handed so poorly he turned down the scene where he regenerates into Sylvester McCoy, forcing McCoy to wear a horrid wig and endure weak special effects during his initial debut. Thought it all, Colin Baker definitely had the right to be bitter and angry at his treatment. Truly, the part wasn’t lost because of him. It was lost because of poorly-written scripts, horrible programming schedule choices, and a BBC Controller with a grudge against him. However, the years have shown that Baker came to grips with what happened, and that, while small, there were still fans who enjoyed his time as the Doctor, one who was a bit more brutal, much more sarcastic and pompous, but also compassionate and understanding of the people and places around him. When Big Finish got permission to release stories staring the “classic” Doctors, Baker took the opportunity and ran with it. He had the chance to play the Doctor the way he wanted to play him, able to give input to scriptwriters eager to solicit the advice someone they had grown up watching on television! And the fans were in for a treat too. Now, they could listen to the Doctor and Peri go on grand adventures without snickering at, or being distracted by, the choice of dress the BBC Wardrobe inflicted upon her. Also, they could hear the Doctor meet new companions, such as the historian Evelyn Smythe and, in the future, Flip. Most of all, they could hear Colin Baker enjoy the HELL out of himself, not worrying about the BBC or Michael Grade or penny pinching or the moral guardians. From the beginning, Colin was a fan of Doctor Who and now, with a company of people who supported him, he could have fun and do what he always wanted to do; BE the Doctor. There’s a joke among some of us that the phrase “Colin Baker turns in a great performance” is legally required by law to be included in every Sixth Doctor audio. It’s a bit of a stretch, but Baker is the type of actor who’s performance can elevate an ‘ok’ script to a good one, and a good script into a great one. While Davison, McCoy, and McGann seem like they’ve slept walk through several of their stories, Colin Baker has dived right into each audio and delivered his lines with gusto, always doing his best to be the bright point that plays down any cracks in the story’s foundation. Well, all things must die. Medicinal Purposes doesn’t suffer from Colin Baker turning in a bad performance. He takes the dialogue and characterization given to him and delivers it with the same pride and bombast that the Sixth Doctor has throughout his time with Big Finish. The problem comes from the fact that the material is incredibly and utterly against EVERYTHING the Doctor stands for, but Baker delivers it with confidence and pride that it’s very alien nature and just sheer wrongness overshadows the rest of the story, including a daring performance by none other than David Tennant . The second half of the above paragraph should raise the flags of anyone remotely familiar with Doctor Who. The Fourth Doctor quietly asked “do I have the right” when confronted with the chance to destroy the Daleks before they become a threat to the entire universe, before deciding that he does not. The Fifth Doctor looked at the corpses around him in the underwater base, wondering that “there must have been a better way.” The Tenth Doctor breaking the laws of time just so he could be the “Time Lord Victorious” and save the Mars expedition, which ended up backfiring as time reasserted itself. These moments all hammer home one of the core tenants of Doctor Who – no matter what, the ends do NOT justify the means. I typed those words, and I can hear Colin Baker delivering them with a weary sigh as only old Sixie can. With a bit of apprehensive appreciation, I would have bought his looking forward to shaking hands with Burke and Hare, admiring them even as he admonishes them. It would have perfectly been in line with Six’s characterization. Instead, it is with pure glee as the Doctor greets Burke warmly, like an old friend, and that’s just flat out wrong. This is the first of three Big Finish audios penned by Robert Ross, known for his books on the history of British comedy, from Marty Feldman to the Carry On series. There are some great concepts in Medicinal Purposes that get lost under the dubious morality and sub-par writing. People are getting sick in Edinburgh, if not being murdered on the streets, and behind it all is the noted doctor Robert Knox. It’s obvious from the beginning that there’s more to Knox than meets the eye, and his verbal sparring match with Evelyn reveals that he just might be the Doctor’s equal…and with the revelation that his house is a TARDIS, perhaps even a renegade Time Lord! Leslie Phillips plays Knox. Phillips is well known in Britain as a comedy actor, who starred beside Jon Pertwee in the sitcom The Navy Lark as well as playing Hactar in The Hitchhiker’s Guide to the Galaxy. Knox oozes charm and plays cat and mouse with the Doctor through three episodes, including laying a very clever trap for the Doctor, but his very confidence brings about his own downfall. He’s smart, he’s clever, and most of all, he’s politely upper class English, as he lets everyone around him know, making his comeuppance very satisfying. While Knox’s performance is great at the hand of Leslie Phillips, his actual plan and scheme is incredibly complex and falls apart under scrutiny. Knox was perfect as a one-off villain who should have gotten what was coming to him…but history shows that Knox washed his hands clean of the Edinburgh mess, so listeners aren’t surprised when he gets away. 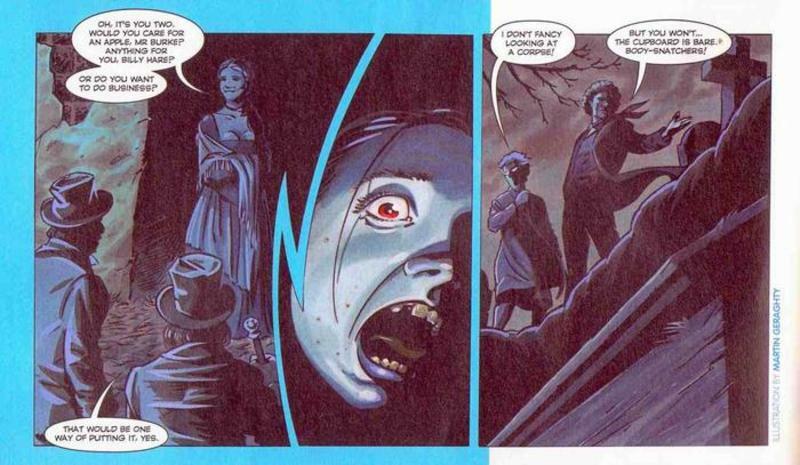 He’ll show up again in a future audio in an attempt to give Six a reoccurring villain, much like Nimrod, but Ross doesn’t fully take advantage of the possibilities that a villain with his own TARDIS would entail. It makes Knox come off as nothing more than a second rate Master, Rani, or even a Meddling Monk; not exactly something that would inspire a future appearance. …because it sure wasn’t Evelyn. If the Doctor’s characterization is the biggest misstep that Medicinal Purposescommits, then the way Evelyn is handled is easily its second biggest. After her character arc’s progression in Project: Lazarus and Arrangements for War, sitting back and “tut tutting” the Doctor mildly is incredibly out of place. She’s seems to be more upset at the way Knox treated her and how Mary kept thinking she was the Doctor’s wife than she was at the Doctor! She gets in a nice bit of verbal sparring with Knox as she walks into his trap, but that’s the high point of her time here. Evelyn’s presence is barely felt in this story, and she really needed to be more prominent to counter the Doctor’s attitude. Instead, Ross just has her mild disagreement noted, even at the very end when everything happens the way history said it should. Medicinal Purposes biggest claim to fame is the presence of one David Tennant, returning to the Doctor Who main range one final time before departing to official become the Tenth Doctor. Tennant is the standout in the supporting cast as he plays Daft Jamie, a historical figure who would be one of Burke and Hare’s final victims, a young man who’s best described by Mary as “touched in the head.” Jamie knows what’s going on, as his mental condition allows him to see the truth behind Knox’s plan, but he struggles to explain what he sees. Tennant really sells the frustration of Jamie as he sputters and tears at his hair, all while doing what he can for Mary. The Doctor, with a soft spot for “a young man named Jamie,” does his best to help him even as he knows his ultimate fate. Tennant’s performance is really moving, and I’ve found myself saying the words “Jamie famous!” every now and again in recent days. Everything about this story, however, falls back to Colin Baker. It doesn’t matter that the story is decent enough and the supporting cast is solid and, as always for Big Finish, the sound puts the listener right into the heart of 19th century Edinburgh with footsteps on cobblestones, drinks clinking together, and Knox’s house/TARDIS materializing and de-materializing. It doesn’t matter that the Doctor finds quiet frustration and resignation in the fates of those he meets during his time in the city. It doesn’t matter that the Doctor appreciates someone to match wits against in Robert Knox, a man almost approaches being close to his level of intellect. It doesn’t matter that the Doctor manages to save the day even as he, regretfully, puts history back on course. All that matters is that Colin Baker turns in his standard top-notch Big Finish performance across the board. But in doing so, he gives credit to the concept that the Doctor would be gleeful when it comes to the act of murder, and that doesn’t fit with any single aspect of the Doctor’s personality. The strength of Colin’s performance only adds to the overall cognitive dissonance. 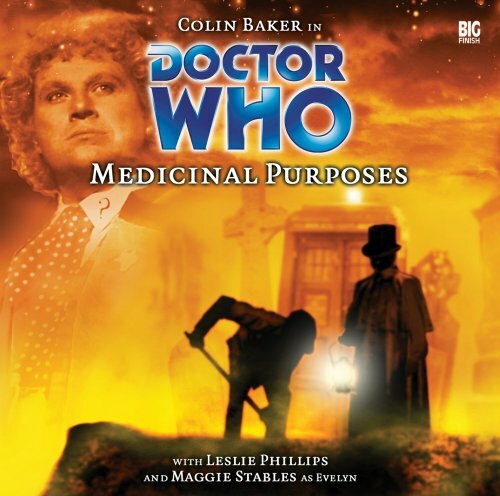 I can’t call Medicinal Purposes a “bad Colin Baker” performance, but it’s definitely the first one I didn’t enjoy. Synopsis – A decent plot and a strong cast are sadly overshadowed by a script that gets a major aspect of the Doctor’s personality wrong in every way possible and a performance by Colin Baker that only serves to support it. 2/5. Next up – The Multihaven, ­a vast array of religions and faiths housed in one harmonious community, ­appears to offer the perfect sanctuary in which to convalesce. But under the guidance of the charismatic Laan Carder, one religion seems to be gathering disciples at an alarming rate. Paul McGann is the Doctor in…Faith Stealer. This entry was posted in Big Finish Review and tagged 2/5, Big Finish, Big Finish Review, Colin Baker, David Tennant, Doctor Who, Doctor Who Audio, Doctor Who Review, Evelyn Smythe, Maggie Stables, Sixth Doctor. Bookmark the permalink. I think you sum this one up well. Colin’s good in it but it doesn’t really feel right. I didn’t care for Knox and I didn’t understand why he was brought back a few years later for Assassin. A bit of a mess really but, as you point out, that really is a rarity for Colin releases.